Mediaplanet’s “Empowering Nonprofits” found within USA Today and online, showcases the California Wildfires as an example of the risks natural disasters pose, and sheds light on commonplace insurance risks for nonprofits. "The recent damage costs from the California wildfires is currently estimated at over $20 billion USD." The recent damage costs from the California wildfires is currently estimated at over $20 billion USD. According to the Nonprofits Insurance Alliance, many nonprofits who were affected this past winter really struggled to get their feet back on the ground in the following months. Dave Gibson, Chief Claims Officer at the Nonprofits Insurance Alliance outlines in the campaign how having certain types of insurance (like property insurance) is just as, if not more important, than having an insurance company that will support your organization and its people in the face of disaster. In addition, Pamela Davis the CEO of Nonprofits Insurance Alliance, discusses how nonprofits can better manage risk in its day-to-day functions and some of the biggest risks facing nonprofits now and tomorrow. 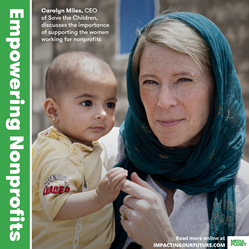 The print component of “Empowering Nonprofits” is distributed within today’s edition of USA Today in Chicago, Los Angeles, Denver, San Francisco, New York and Washington DC/Baltimore markets, with a circulation of approximately 250,000 copies and an estimated readership of 750,000. The digital component is distributed nationally, through a vast social media strategy, and across a network of top news sites and partner outlets. To explore the digital version of the campaign click here. This campaign was made possible with the support of Save the Children, Association of Fundraising Professionals, ANA Nonprofit Federation, Blackbaud, Community Brands, Nonprofits Insurance Alliance, UNIT4, RevUp, Act Blue, Community Brands, Acxiom, Wizehive and the Foundation of Hope. Nonprofits Insurance Alliance is a group of 501(c)(3) nonprofit, tax-exempt insurers whose purpose is to serve 501(c)(3) tax-exempt nonprofit organizations by providing a stable source of reasonably priced liability insurance tailored to the specialized needs of the nonprofit sector and to assist these organizations to develop and implement successful loss control and risk management programs. Visit http://www.insurancefornonprofits.org for more.